Snoods, snoods and more snoods! Do you know what a dog snood is? Well, it’s something I use every day to keep my ears out of my food! 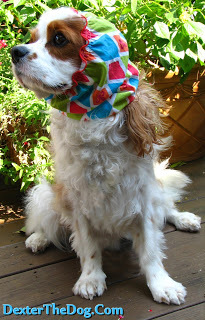 You can read more on my first dog snood review HERE! 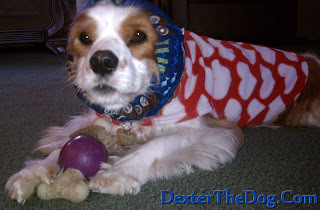 Mom bought my very first dog snood from Terri at Day Dog Designs in 2012. At that time Mom didn’t know if I would wear it or not. So Terri was so kind and made one that was not as long per Mom’s request. It wasn’t long before Mom realized that I liked my snood just fine….after all, I did eat when it was on! How could this possibly be a bad thing?? 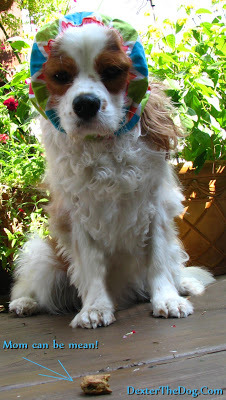 So, she ordered a regular-sized dog snood from Day Dog Designs! Terri makes other dog items too, like leashes, collars, and other pet gifts. So go check out Day Dog Designs and tell Terri Dexter sent you! That’s a treat, not nice Mom.